By Brooke Holland, Noozhawk Staff Writer | @NoozhawkNews | December 2, 2016 | 9:46 p.m.
Santa Claus, holiday jingles and candy canes are all exciting, but Nicholas Morales was anticipating something he thought was more important at Friday’s 64th Annual Downtown Santa Barbara Holiday Parade. “The colorful lights,” the 10-year-old Junipero Serra Elementary School student said. 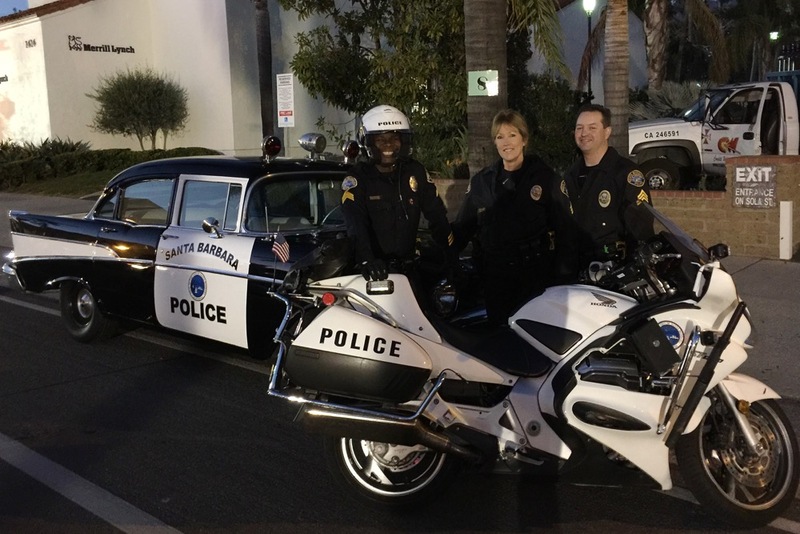 Residents in the city of Santa Barbara kicked off the holiday season with a Under the Sea themed nighttime parade. Floats decked out with sea creature balloons, illuminated displays, and community members sporting blinking necklaces made from mini Christmas lights and singing carols moved down State Street. More than 90 organizations and more than 3,000 parade participants of all ages marched from Sola Street to Cota Street. An estimated 65,000 spectators lined State Street, bundled in scarves, winter coats and young children waited for candy to be thrown by parade-goers. This year's co-grand marshals were Cody Walker and Caleb Walker, brothers of the actor Paul Walker, 40, who featured in the Fast & Furious movie franchise and died in a car accident. Both brothers said they enjoy visiting Santa Barbara and have close ties to the area. Caleb Walker studied at Santa Barbara City College, and Cody Walker is a 2011 UC Santa Barbara graduate. Cody Walker took over as CEO of former Santa Barbara resident Paul Walker’s charity Reach Out WorldWide, a nonprofit that works to provide first responders to areas impacted by natural disasters. The celebration started with the holiday prince Kai Paterson and fairy Alexandra Chadwick lighting a towering 45-foot holiday tree installed near Arlington Theatre. The Douglas fir, covered in white lights, traveled more than 280 miles from Shaver Lake, California. Consumer Fire Products, Inc., delivered the tree and the business was the featured sponsor of the celebration. Paterson, 8 — his 9th birthday is quickly approaching — and Chadwick, 10, led the parade riding in a red 1968 Shelby GT500 convertible. Both youngsters said they were excited to participate this year. 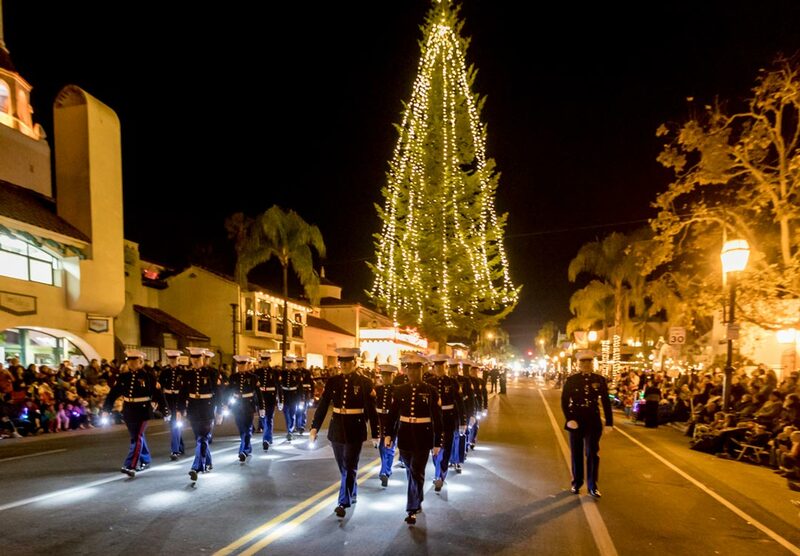 The United States Marine Corps’ Kilo Company, 3th Battalion, 5th Marines were featured parade guests and also helped light up the holiday tree. California State Senator Hannah-Beth Jackson, Santa Barbara City Council members, representatives from Santa Barbara Police Department and the U.S. Forest Service waved to attendees down the parade route. Saint Nick closed the celebration. Rhodes also noted the Unity Shoppe food, clothing and toy drive that will run through Dec. 20 at participating downtown businesses. People can drop off donations at businesses hosting a toy or coin collection box. “It's a great way to give back to the community,” Rhodes said. 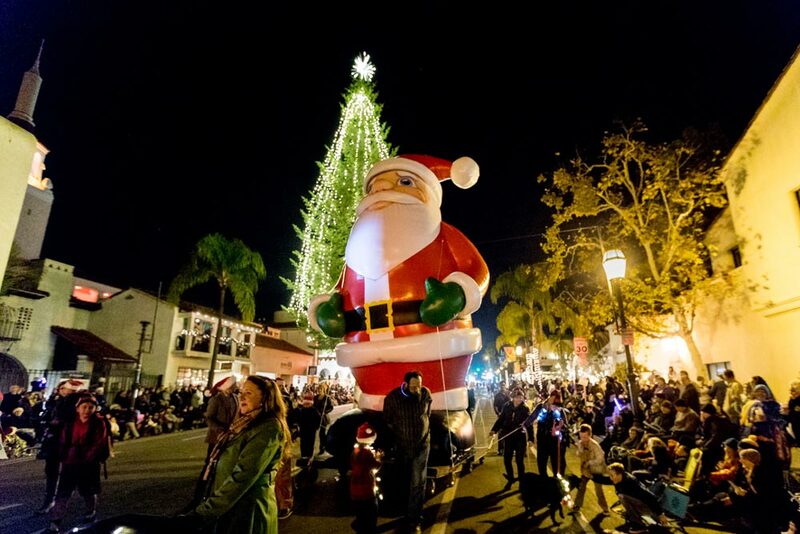 Click here for information on more holiday-themed events in Santa Barbara County in the coming weeks.